Background: Nasal fractures are common and most frequently cause mediolateral bone displacements from an oblique force from the side. 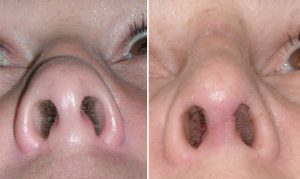 These are repaired in a straightforward fashion by relocating the nasal bones in a reverse direction that the injury has caused. This approach can be successful due to the underlying support of the maxilla and orbital bones. But traumatic forces that strike the nose directly from straight on cause a more complex type of nasal injury. The dorsal line (bone and cartilage) gets pushed inward as the underlying supporting septum is telescoped and shortened in length. Like the loss of support from that of a collapsed tent pole, the dorsal line becomes more of a V-shape indentation. 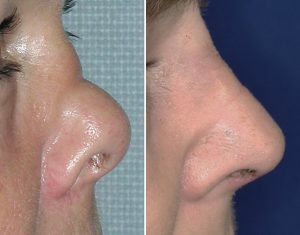 In more modest nasal impactions reconstruction may be able to done with local cartilage (septum) as much of it may remain intact. 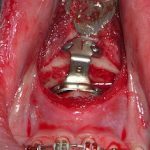 Severe nasal impactions injuries of any prolonged duration are going to require both an open approach to treat and the need for cartilage recruitment. Dorsal grafting may consist of either septal reconstruction with spreader grafts or the dorsal line may be onlayed bypassing what lies underneath it. This depends on the degree of bone and cartilage displacement as well as the integrity of the underlying septum. Case Study: This female was involved in an altercation that resulted in a nasal impaction injury. When seen well after the injury a horizontal line was seen right across the middle of the bridge and the nasal tip was rotated upward. Internal nasal examination showed a large septal perforation below the line of indentation. 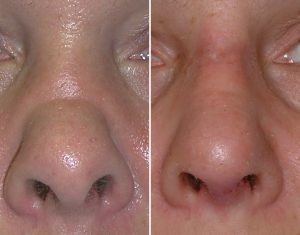 Under general anesthesia and through an open rhinoplasty approach, a rib graft was harvested below the inframammary crease of one breast. A solid cartilage rib graft was harvested and placed as an onlay on the bridge and brought down to below the dome tip cartilages. This not only re-established the dorsal line but derotated the tip of the nose. A strong graft construct is needed to remake the L-shaped dorso-columellar line when septal support is lost. An autologous rib graft provides the support needed because of its volume and rigidity. 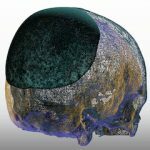 1) Severely impacted nasal fractures may require secondary nasal reconstruction with cartilage grafts. 2) With traumatic collapse of the septal support of the nasal bridge, a rib graft may be needed to re-establish the dorsal line. 3) A solid rib graft may be preferred over a diced one with loss of septal support.